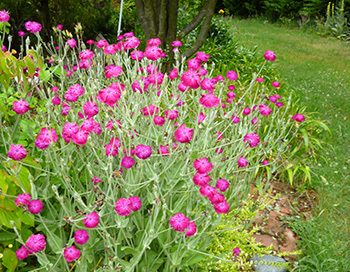 Lychnis is encouraged to self seed in my garden. Originally I thought that only the white variety would be welcome, and I carefully collected seeds off the first plant. 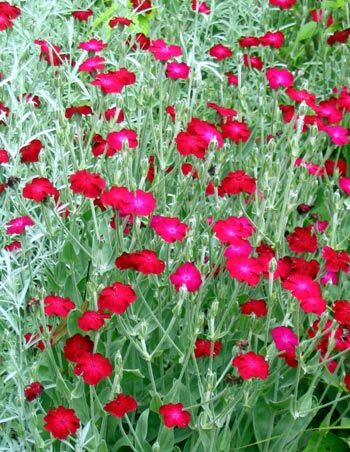 I didn't realise then how prolific Lychnis was, or how much my colour tastes would widen. I don't collect Lychnis seeds any more. I just let the plants do this work for me, and that way the plants turn up in unexpected places. Actually there are often far too many of them - my weeding hand tools get a lot of use! Over the years I seem to have acquired a trio of Lychnis colours - white, magenta, and a mid pink. The deep magenta is my favourite. 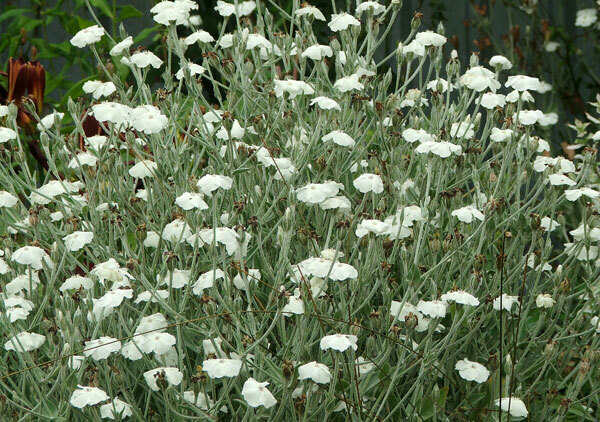 Just one of these plants makes a border wake up and be noticed, and the greyish leaves are the perfect foil. I find small seedlings easy to transplant, too. The flowering cherry tree by the driveway is surrounded by a ring of pink, white and magenta Lychnis plants which were shifted there in the heat of early summer and barely watered. My garden has a lot of green, in deliberate foliage plants, ordinary leaves of plants in the borders, and in the large sweeps of lawn which connect everything. All this green-ness cancels out any harsh effects that the strong magenta colour might have. I love it, and woe betide any trendy magazine that might insult it. I will immediately cancel my subscription! I also appreciate and adore the white variety, which looks so splendid at dusk. This last spring I deliberately left lots of white Lychnis plants filling the gaps between roses in the Glass-House Garden. Maybe I was a bit generous. The roses struggled on in summer, lost in a sea of white froth, and some found it difficult to reflower. Oops. I had to pull all the Lychnis out - after it had flowered, of course!